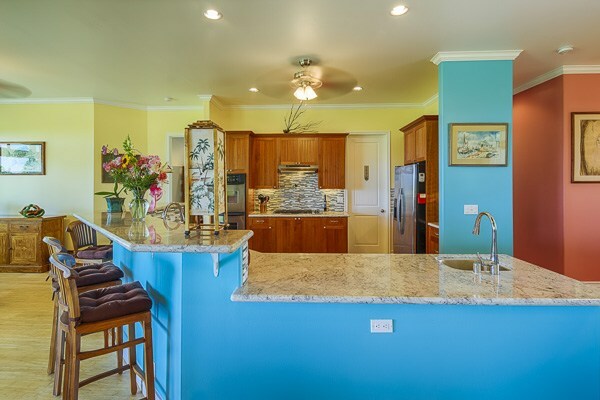 There is a LOT to love about this newly listed Honomu Village home! 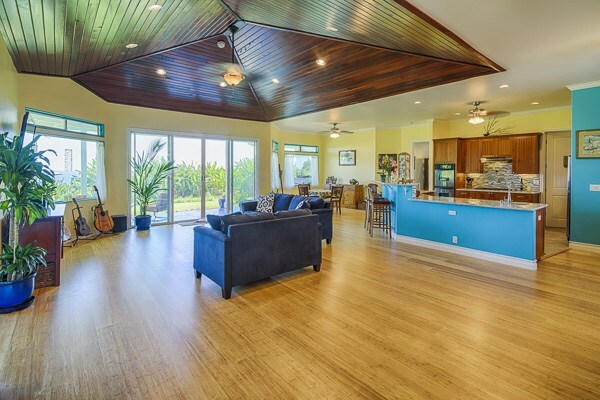 Tucked in along the beautiful Hamakua Coast and close to one of the most amazing waterfalls in East Hawaii, this spacious Big Island home encompasses 2,672 square feet of living space with three bedrooms and three bathrooms. 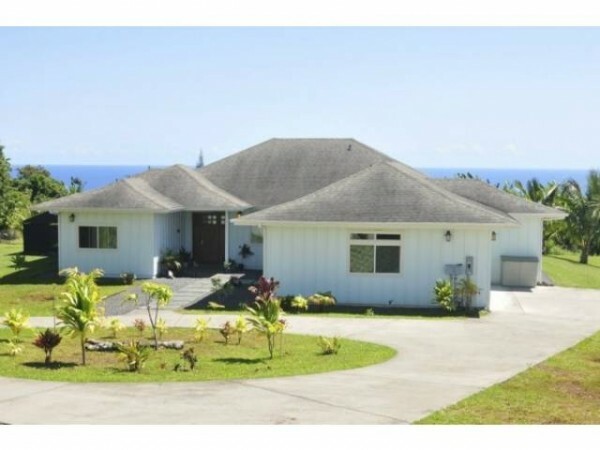 Situated on 1.28 acres, 28-256 Akaka Falls Road is a quality built home designed with privacy in mind, with peek-a-boo ocean views from almost every room. Newer construction with many, many upscale finishes, this wonderful property is nothing short of a luxury residence! You’ll forgive my use of exclamation points, but this house is truly unique! A paved circular driveway and landscaped covered front entrance give a hint to the relaxed elegance you’ll find behind the 8-foot solid wood door entrance. The great room features a vaulted 10-foot ceiling with a custom wood ceiling treatment. The great room with custom wood ceiling treatment. Light and airy, this open concept living space features solid bamboo flooring and plenty of room for friends and family. Large picture windows and sliding glass doors offer views of the lush tropical landscaping with the Pacific Ocean glistening in the distance. The kitchen is a chef’s delight with double ovens and stainless steel appliances, including an oversized gas range. That careful attention to detail I mentioned earlier is evident in the kitchen too. 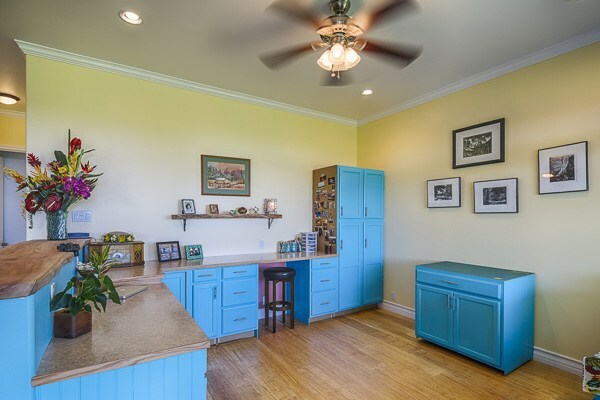 Entertaining groups small or large is a breeze with two sinks AND two dishwashers. There’s bar seating for four at the long granite countertop island, plus a formal dining area. An added benefit: you’ll find a bonus office space and half bath just off the great room. The office space includes a built-in granite countertop desk area and wooden cabinets with plenty of storage space. 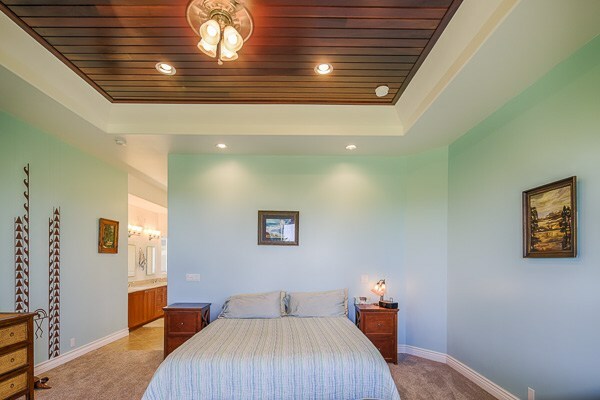 The large master bedroom has plenty of space for a unwinding, plus its own private sliding glass doors and lanai. In the master ensuite bathroom you’ll find a spacious walk-in closet, double under-mount sinks, generously sized granite counter space, and double shower showerheads, plus a custom-tiled soaking tub. 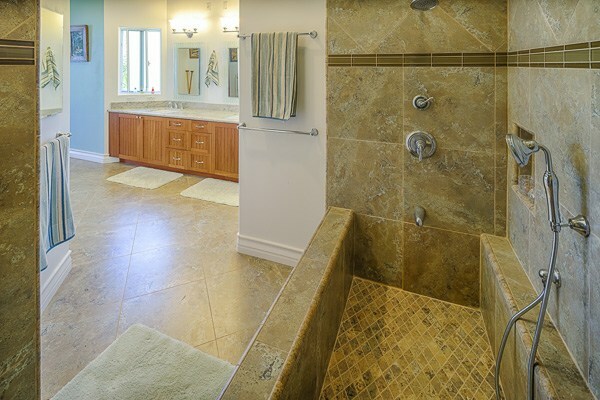 Indeed, all three bedroom suites have their own bathrooms that feature large tiled showers and deep bathtubs. Additional features include a well-appointed laundry room with sink and cabinet space, and an attached two-car garage with protected entry into the house plus plenty of room for storage. Enjoy majestic sunrises and ocean views from the comfort of your lanai. Lushly landscaped, the grounds include many new fruit trees, including avocado, coconut, lemon, lime, orange, and grapefruit. Flowering trees and tropical plants on property include puakenikeni, hibiscus, ti, koa, and rainbow eucalyptus. What’s more, this fantastic home is walking distance to Honomu Village, a delightful small town with shops and restaurants. Picturesque Akaka Falls State Park is just up the road, perfect for picnics and hiking. And Honomu is just a short drive to Hilo, the second largest city in Hawaii with plentiful opportunities for dining, shopping, and entertainment. Offered at $695,900, this exceptional East Hawaii property is sure to please the most discerning homebuyer. 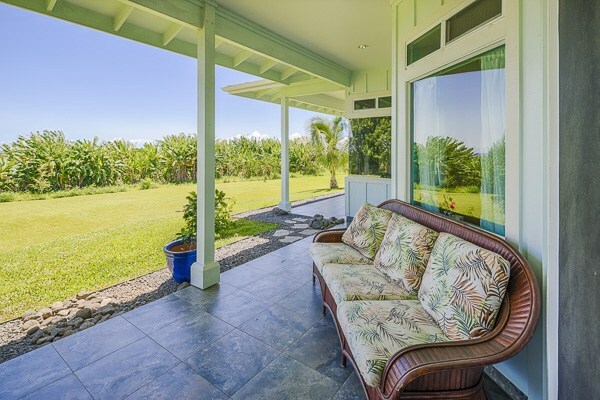 If you’d like more information on this truly wonderful Honomu Village home, or other Hamakua Coast properties for sale, give me a call today at (808) 937-7246 or email me.